Working for 7-8 hours a day sitting at your desk can be a disturbing and uncomfortable experience for your body, resulting in pain and stiffness in the neck, back muscles, and shoulder. Busy work schedule is often said to be the reason for not exercising. 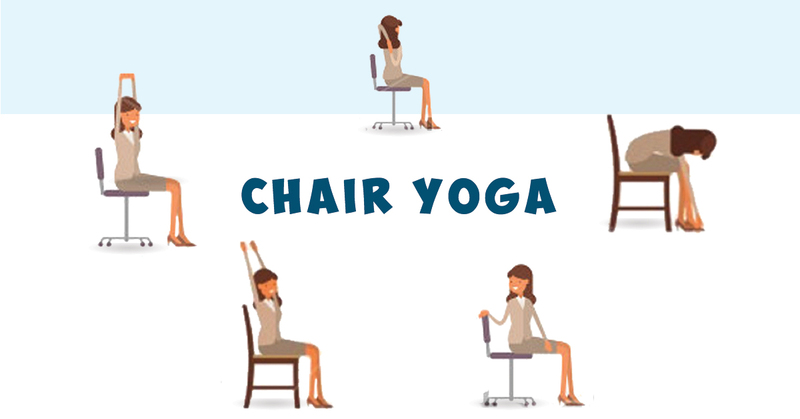 Why not try these five yoga poses while sitting at your desk to help you relax, stretch and re-energize? twist can help in releasing any back tension, improving digestion and sitting posture. Seated forward bend- Bring your arms behind your lower back and interlock your fingers while sitting straight. From the waist, lean forward bringing the hands over the back. Now hold still and breathe 5-10 times. This position is particularly helpful in releasing back and shoulder tension, increasing flexibility and relieving backache. Forward Fold- Stand up straight and fold forward, letting your shoulder and head hang down. Stand still and breath 5-10 times. Slowly stand back straight and after a few long breaths repeat the process. This position can improve balance, flexibility, and destress neck and shoulders. Finger stretch- Placing your fingers pointing downwards, stretch your hand on the desk. With your other hand apply gentle pressure to counter-stretch it. Hold it for a couple of seconds before losing it. Repeat the process on the other hand and do it 5-10 times on each side. This exercise is an effective way to release the tension ins wrist and forearm. Cow face arms- Sitting in an upright position, place your right arm behind your back and left the arm behind the head. Clasp your fingers and while holding still, breathe 5-10 times. Switch arms and repeat Practice this position to improve posture, core strength, and relax shoulders.